Q: We have always dreamed of building a log home. How do we get started? A: We are involved in the building process well before any construction begins. From selecting plans to helping procure permits, we can help you from conception to completion. We have worked with many different lenders and can offer advice and refer you to local log home construction loan experts. If you are still looking for the perfect piece of property, we have a Washington State Licensed REALTOR on site. Our experience and knowledge will expedite your entire construction project. Q: Can you work with plans other than Lodge Log’s standard plans? A: Absolutely! We can customize any plan, be it yours or one of ours. As a matter of fact, we have yet to build a house without at least a few minor changes to the plans. We’ll help you design the perfect floor plan that fits with your lifestyle, budget, and architectural design needs. Our standard home floor plans are very versatile, and many changes can easily be made. Door and window locations, as well as interior walls are quite easily moved. Room sizes can also be changed. We want the home to be exactly what you want and need. Do not hesitate to make it your custom home. Q: What kind of logs do you use? A: BW Construction uses an air cured, kiln-dried, turned log. They are available in several species, including pine, fir, cedar, and tamarack. However, we work almost entirely with pine, as it has usually been the choice of my customers. It is light colored with an attractive and distinctive grain pattern. We call our homes “contemporary log homes”, as the logs are all true to size, grooved to fit tight with no chinking, and bolted together with a Thru-bolt system. We combine the best of nature with the latest technology to create a log home that will stand the test of time. Our log sizes are available in sizes from 8” to 12”, with 7” available for garage construction. Q: Do your logs shrink? How much checking can we expect to see? A: Our kiln-dried logs shrink very little, generally 3/8” or less per an 8-foot stacked log wall, which is about the same as you see in standard frame construction. We make minor allowances for it as the house is built. We can eliminate almost all log checking or cracking, by cutting a curing kerf in the log prior to drying. However, it is common to always see some checking, but it is minor and the checks are small. Q: Are log homes more expensive than traditional, stick-built homes? A: Given the same size and features, the cost of a BW Log Home is comparable to many custom-built stick-frame homes. However, people who build a log home usually plan to stay in them for a lifetime; and therefore, invest in higher quality fixtures and finishing materials, which raises the value. Each home that we build is uniquely different and customized to the owner’s lifestyle, tastes, and budget. Q: Are log homes harder to finance than traditional construction? A: Not really. While your neighborhood bank may have little or no experience with log home construction loans and mortgages, there are a number of lenders who are more familiar with the product and thus willing to work with you. BW Construction is teamed with Timberland Bank, your local Log Home Financing Specialist. 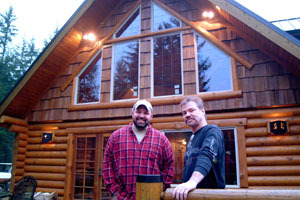 Timberland does construction loans for log homes in both WA & OR state. They do all-in-one Construction Loans-only one set of closing cost for construction and permanent financing. Timberland will pay off the shell and provide funds to complete the construction and then turn the construction loan into a conventional loan. Q: What type of maintenance is needed for a log home? A: Lodge Log homes typically require less maintenance than a conventional stick-frame home, due to their unique difference as a result of their patented Thru-bolt system. A preservative treatment – with stain if desired – is recommended as soon as possible after construction is completed. Depending upon the manufacturer and environmental exposure the preservative should be applied to exterior surfaces every three to five years. Other manufactures of Log Homes that require chinking do require considerably more maintenance throughout the years as they settle and shrink. Q: Are log homes energy efficient? A: The thermal properties of wood make logs great insulators, and the insulation value increases with log diameter and the cellular structure of the wood type. LOGS have an ability to store energy, which is the concept of "Thermal Mass." Once you have heated up or cooled down a Log Home it takes little energy to maintain the house to that temperature. This heat retention phenomenon is also referred to as "thermal capacitance" or time lag - the resistance of a material (such as solid wood walls) over time, to allow a change in temperature to go from one side to the other. Lodge Log Homes stand the test of time from season to season due to the Thru-Bolt system, the unique air & kiln dried curing process, the tongue & groove with the sealing strip moisture barrier applied between each log - which all directly contribute to another important Energy Saving Feature that Lodge Logs unique system delivers and that is the Air-tightness of their Log Homes. Just remember that a BW Lodge Log Home will keep you warm and will exceed the R-Value of any other type of home - be it Log or Conventional! Q: What is your sales area? A: We serve the Kitsap and Olympic Peninsulas and The Greater Northwest region of WA & OR. Q: Can we buy a log package from you and build the house ourselves? Lodge Logs Wall Package: Includes kiln dried logs, pre-cut (Windows and Doors cut to width), pre-drilled and pre-notched log wall system (@ 8 feet high), foam sealer, Thru-Bolt Fastening System, and associated hardware. Log home pricing will be based on standard home plans as shown in the Lodge Logs plan book. Any custom design changes will require re-pricing. Please specify wood species, log profile, and log diameter when requesting pricing information. Lodge Logs Shell Package: Includes Log Wall Only Package (9 foot log walls) plus full log gables, second floor log joists, log roof members, vertical log support posts, dormer face logs, and half log siding at dormer sides. Roof snow loads are estimated at 60 lbs. per square foot. When roof loads require greater than 60 lbs. per square foot pricing will be adjusted to accommodate changes. Please note your snow load when requesting pricing information. Pricing will be based on standard plans as shown in the Lodge Logs plan book. Any design changes will require re-pricing. Please specify log species, log profile, and log diameter when requesting pricing information. (Note: Log floor joists and log roof system could require on-site notching and angle cuts.) Our Pre-cut Milled Log Packages are tongue and grooved logs that are kiln dried below industry standards. No chinking is required with our log packages. Some on-site cutting, trimming and fitting is still necessary on the log package. A: We are a full service construction company. Most of our log homes are turn-key finished homes, but we also construct shells if the customer so desires. We build to suit, so we just need to know what involvement in the project you want from us. We build log homes and sell a full range of log home-related building materials, including log home packages, log railing systems, log posts, log roof trusses, hand-scraped flooring and Scotch-pine interior doors from Finland. Q: Why are you associated with Lodge Log Homes? A: In a sentence: The consistent QUALITY & Customer Satisfaction is why we represent Lodge Log Homes. Over the years we have worked with several different brands of Log Home manufactures and have found that none compare to Lodge Logs. These logs are consistently dry, straight, and deliver what they promise in terms of minimal shrinkage, settling, & maintenance. The best testimonials are our happy proud home owners who will invite you into their homes anytime to show off their dream creations. In our opinion Lodge Logs are the leader in milled log homes, which is very important to us, as we guarantee everything that we build-along with Lodge Logs Lifetime warranty. Lodge Logs Thru-bolt system, drying kerf, air & kiln dried processing system, use of live standing timber, & solid core heart wood in every log all combine to give you the best built Log Home on the market and is the reason why BW Construction exclusively builds only Lodge Log Homes.